For getting the fastest USB speeds out there, older USB ports aren’t going to cut it. Most peripherals are probably pretty well served by simple USB 3.0 connections. Keyboards, mice, and similar devices don’t exactly need to make use of the higher bandwidth potential of new-age USB formats. But some devices really do depend on the higher bandwidth potential of USB 3.1 and beyond. That’s especially true when it comes to data storage devices, like portable hard drives. Even if you have a speedy drive built with flash memory architecture, you might end up with transfer rates that make you feel like you’re back in 2008. Because you’re never faster than the slowest component in your build. Fortunately, it’s usually pretty simple to find an effective PCI-Express expansion card. You just have to consider a few essential things. Basically, you’re trying to answer two questions, will it work in your case, and will it work in your PC. It also helps to know how you plan on using the ports you want to add. For the most part, PCI-E Express cards tend to be pretty compact. But some are more compact than others. And when you’re building inside smaller cases, even half an inch of space can make-or-break your selection. If you’re someone who’s using a smaller form factor case, you’ll want to be on the lookout for appropriately sized mounting brackets. The inclusion of low-profile mounting brackets is a dead giveaway that you’re dealing with a PCI-E card that was intended to be stuffed into a smaller case. If you’re using a full-sized tower case, the inclusion of a low-profile mounting bracket doesn’t necessarily mean you’re going to have an issue with installation. But on rare occasion, small form factor devices have trouble when placed in larger systems. When you find yourself choosing a smaller expansion card for reasons unrelated to its size, you probably won’t encounter problems with size at all. But better safe than sorry. Some PCI-E expansion cards will offer different port options than others. There’s a finite amount of bandwidth you can pull across the number of pins that are used in cards like these, so you’re typically limited to between two and four ports. You can’t put a hundred USB-C ports into a PCI-E card like this. You’d need to move over to one PCI lanes with more bandwidth, potentially displacing a GPU, in order to vastly expand the number of ports at your disposal. 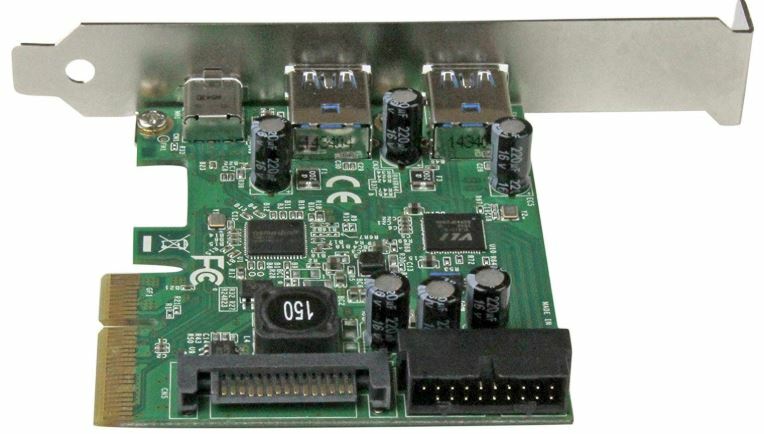 However, within the bandwidth limitations of 16-pin PCI-E slots, it’s often possible to mix and match which ports your expansion card ends up offering you. For instance, you might get USB-A ports, USB-C ports, internal USB ports, and combinations therein. This is where it helps to know exactly what kind of ports you’re looking to use. Just because you’ve got a USB-A 3.0 port doesn’t mean you’re going to get a rapid recharge from it. Some expansion cards deliver more power than others. For the moment, the golden standard is really 3A ports. But having to work with slightly slower 2.0A or 2.4A ports isn’t something that most people should consider a disqualifying factor. The differences in charge speed between those options is not night-and-day. These differences are really only important for people who intend to use their added ports specifically for recharging their mobile devices, and doing so on a regular basis. In other words, scenarios where shaving 15-minutes off your smartphone recharge time would really matter to you. Some expansion cards may or may not have built-in optimization for Thunderbolt. Many cards that do have Thunderbolt support might not have that support for the versions or features that you are interested in. For someone who relies on Thunderbolt support, these details can matter quite a bit. Finally, aesthetic is a pretty minor concern. The people who make PCI-Express expansion cards understand that their target audience doesn’t care that much about how their card looks. But with the increasing popularity of PC cases that have viewing windows built-in, good looks can serve as a tiebreaker. For uglier cards, you can always hope they’re smaller and easier to hide. StarTech specializes in adapters and similar peripherals, so it’s not surprising to see the PCIe cards they’ve made are mostly pretty solid. From a style point of view, these cards are bare chips, which is pretty utilitarian. You don’t tend to see that much anymore, as more and more brands start to build face-plates over their designs, or even stickers. But if you don’t mind these cards being a little ugly, you should find StarTech provides no reason for you to dislike the hardware itself. Though StarTech potentially commits the sin of providing too many different options, if you know what you want, you’ll have an easy time finding it with them. 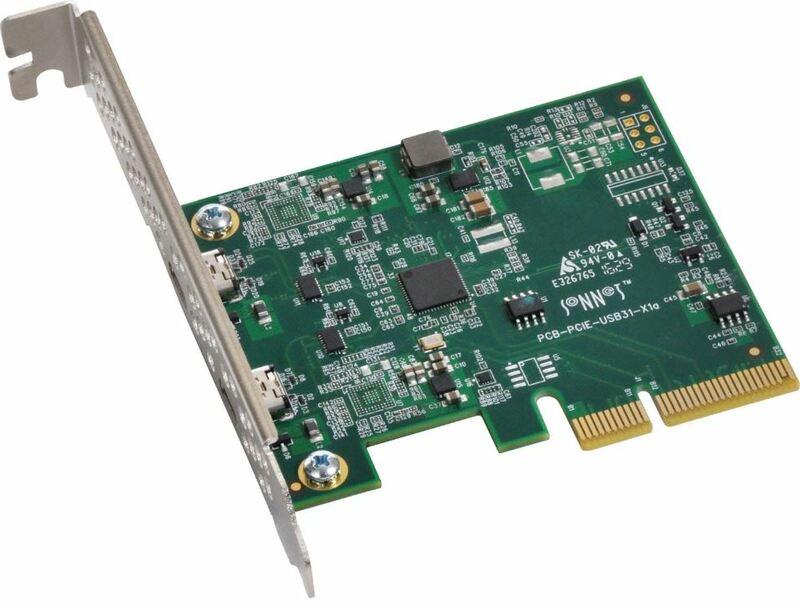 StarTech has an enormous number of options for PCIe expansion cards. 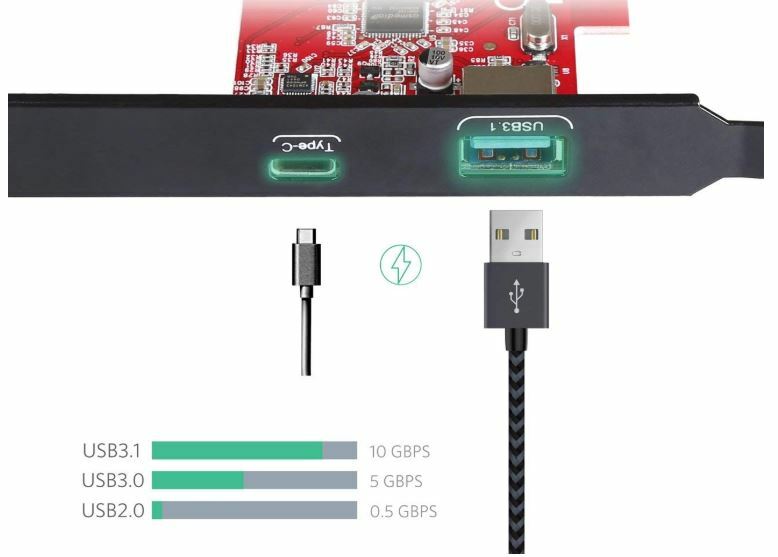 Including cards with two USB-A ports, a pair of USB-A and USB-C ports side by side, two USB-C ports, USB-A ports with eSATA ports, internal USB ports, and more. Basically any combination of ports that you can imagine, StarTech has created it. Limited only by the relatively large bandwidth of the PCI-E infrastructure these cards are based on. With the right combination, it’s possible to avoid having to install several types of different cards. Quite useful for someone who actually needs to use more than one format of USB. Because each StarTech card is slightly different in terms of its support, these cards vary slightly in size. But they’re all pretty close to 3.0 x 0.7 x 4.6 inches. Fairly standard size for PCI-E cards. In addition to the card, StarTech includes a low-profile bracket for installation into a smaller form factor case. In this case, the low-profile bracket does not actually indicate that larger cases will have trouble with installation. So you could basically consider these cards as being a near-universal fit. Though extremely small cases are always a noteworthy exception to these kinds of rules. This kit also includes a quick start guide. The guide doesn’t happen to be very useful, but if you encounter some type of problem, it gives you a starting point. If you can’t pin down the issue, StarTech isn’t exactly a household brand name, but their customer service is actually pretty good. Plus, their equipment includes a two-year warranty. The warranty only covers the sorts of things you’d expect it to cover, it doesn’t cover things like accidental damage. 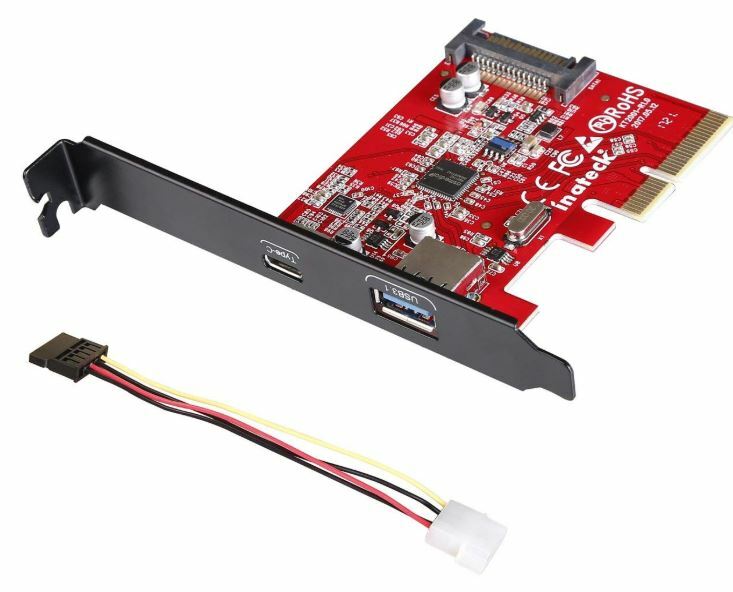 The Inateck PCI-E to USB 3.1 PCI Express Card has a couple of things going for it. It’s wonderfully easy to install. It’s got wide compatibility with a number of different operating systems. It’s even reasonably attractive on account of the unique red card. 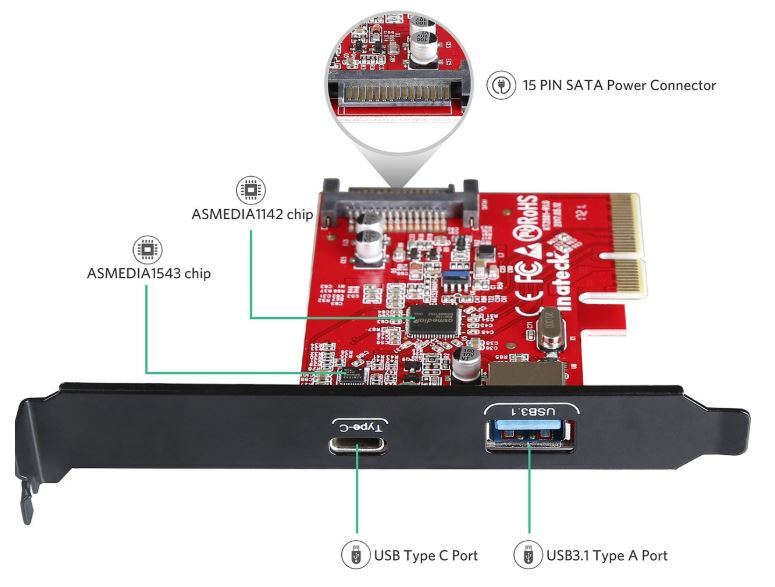 But depending on what kind of ports you need and how much power you need to draw from them, the Inateck PCI-E Express Card can also be an exceptionally cost effective way to add more ports to your system. Inateck’s PCI-E card measures 4.76 x 3.23 x 0.71 inches, making it one of the more physically compact cards out there. For inputs, you’ll find this card allows you to connect with a USB 3.1 Type-A port, and a USB-C port. In either case, you have access to 10Gbps of data connectivity through the 15-Pin SATA power connection. That allows you to take full advantage of the USB format. It’s worth noting there are actually two versions of this card. Though mostly identical to the first, the second version is built with four USB 3.0 ports. That’s quite a few ports. And it’s possible to draw full bandwidth from each port without interrupting any of the others. A pretty smart design. Additionally, you can basically use this card in a hot-swap capacity. Installation is plug and play, as the drivers will install themselves. Not many people will end up going that route, but it’s worth pointing out for those who do. Because this is only a USB adapter, you can’t connect monitors through it. It’s also not able to be used with an external GPU because you would need Thunderbolt 3 support. Even though this device supports Thunderbolt, the third version needs to be integrated with your motherboard to work. That’s just a limitation to the format. For compatibility, this card was made specifically for Windows and Linux. Your motherboard needs a PCIE x4 slot, or a slot with more power than that. If you can meet those low requirements, it’s pretty smooth sailing from there. Sometimes you need a little more juice from your USB ports. The Sonnet Allegro USB-C Card was built to provide super-powered ports. In a literal and figurative sense. Because they can support devices up to 15W while running 3A for each port. Moreover, that amperage does not decrease as you plug in more than one connection, which is pretty nice. And not something you can say about many similar adapters in this price range. Though the 15W limit isn’t going to let you run a laptop through this expansion card, it shouldn’t cause you to encounter power limits when it comes to driving smaller portable devices. Similar to the other cards on this list, the Allegro has a pretty standard design for a PCIe card. It measures 8.4 x 5.3 x 0.9 inches, making it no hassle to pop inside of most PC cases. Even small form factor cases really shouldn’t encounter issues, at least, to the extent that issues are ever avoidable when you’re dealing with a smaller case. The Sonnet Allegro makes use of SuperSpeed+ USB tech, which allows you to add two USB—C ports to your system through a PCIe connection. Thunderbolt support means you can haul data about twice as fast as an ordinary USB 3.0 connection, which was already pretty fast to begin with. Very useful for people engaged in data storage or data backup of one type or another. However, the Thunderbolt optimization is not compatible with Mac OS 10.11. Beyond that, you’ll find this card works for Linux, Windows, Mac, and so forth. Pretty much across the board you’ll find no issues with compatibility because of the universal PCIe connection system being paired with universal formats like USB-C. The ports have been power-protected with isolated circuitry to ensure that cross-coupled power glitches don’t occur. Those kind of things sometimes happen when accidental disconnects take place. Without getting into every gritty detail, these cards were built with resettable fuses, allowing you to shut down your machine to reset a fuse without any permanent damage to the card or computer occurring. Very useful for more advanced users. 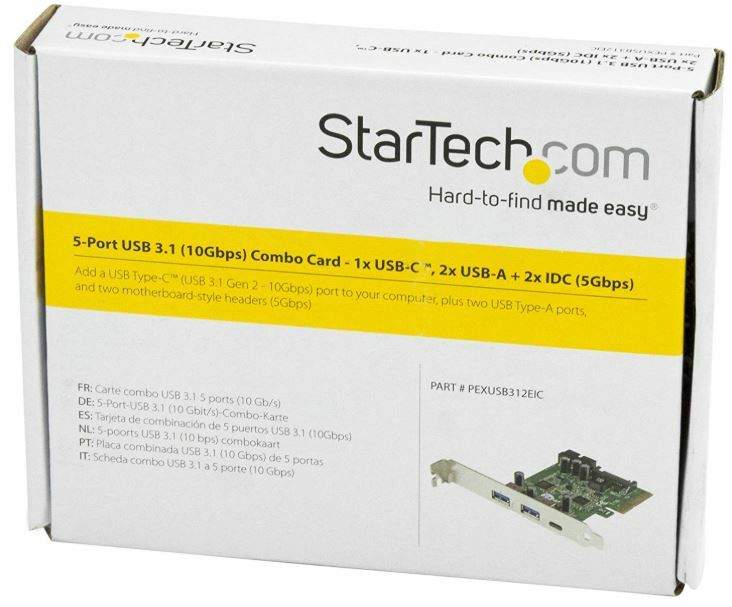 The StarTech.com USB 3.1 PCIE Card comes in a bundle of different formats. For someone who’s looking for a highly specific and unique array of port options, these cards are clearly worth a look. You can get mixtures of USB-C, USB-A, and other ports ad nauseam. The cards themselves are pretty solid, too. 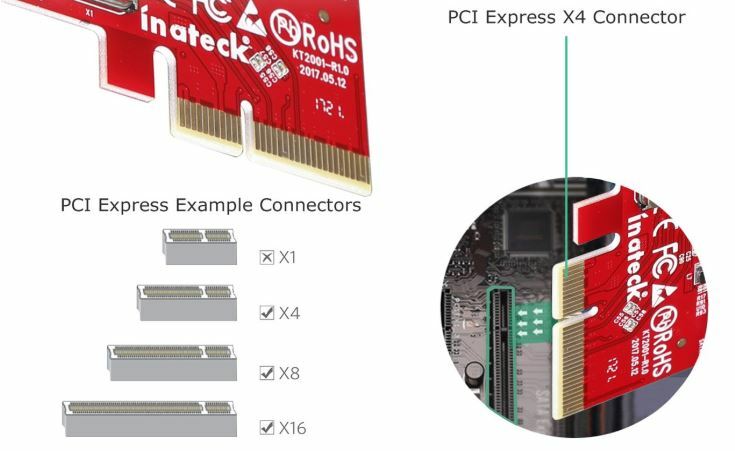 By a small margin, the Inateck PCI-E to USB 3.1 PCI Express Card is the most attractive card on this list, which probably makes it the right choice for someone who’s got a window case. But superficiality aside, this card delivers where it matters most. It’s widely compatible with Windows and Linux systems, and setup is basically plug and play. Provided that you know how many ports you need, and what type of ports you need, you really can’t go wrong with cards like this. Trying to recharge your stuff? 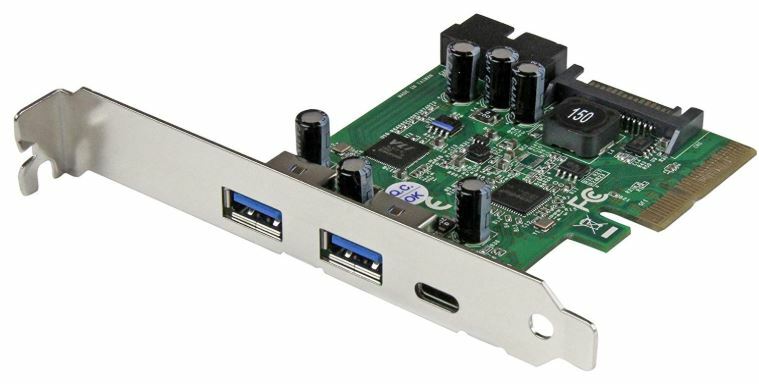 The Sonnet Allegro USB 3.1 PCIe Card is super powered. Along with all the same bandwidth advantages of the other PCI-E cards on this list, this card was made to be a little bit quicker at recharging mobile devices. Though these differences are generally small, like shaving 15-minutes off your smartphone recharge time, they do matter to some people. If that describes you, Allegro could be worth using. I installed mine to use with a mixing board allen heath qu 32, but it does not work , Do I nee to connect the power cable to make it work ? looks lika a 20 pin, small, flat….or it work withhout ? Some older PC’s have varying versions of PCI express, from 1.0 to more modern 3.0. PCI express 3.0 is definitely faster than 1.0. Will a PCI express USB 3.0 card be limited by say a PCI express 2.0 slot? Yes, attach the next available SATA power connector to that input. The mixer’s usb chipset needs a handshaking voltage apparently.